November is the time of year when we all stop to think about what we are thankful for. It is a wonderful reminder of the amazing people, places and things we experience in our lives that we sometimes disregard on a day to day basis. Giving thanks should not be limited to the month of November though and we should be grateful for each day that we have with our children. Take the time to play I am Thankful Categories Game. You can download this FREE printable at the end of the post. The download is in black and white therefore economical printing plus not too jazzy so you can play this game anytime of year that you want to stop and smell the roses. And so on, down the list of 15 items. If you are playing with a group of people you will only have one minute to answer. Read your answers out loud. Anyone who has the same answer has to cross it out. The person with the most remaining responses once all answers have been read out loud is the winner! If you want to play by yourself, see how many you can answer in one minute. Or simply, fill out the game board at your leisure and write the date on it. Next year, around the same time, fill it out again. Put them all in a folder to remember what you were grateful for each year. 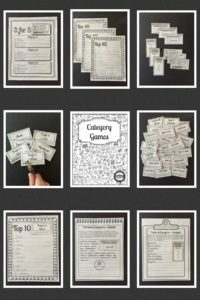 Categories Games – This 42 page PDF download includes 4 category games to play with the family. You can play with one player or as a large group. Just print a recording sheet for each player. Want to play the game on the road? Print over 200 category cards and go! Use a hole punch to record words or color in the circles on the cards. This download also includes a BONUS party pack extension with everything you will need to host a Category themed family game night. There is an invitation, food menu ideas and to do list. 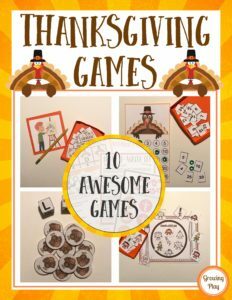 Thanksgiving Games – This Thanksgiving Games digital download includes 10 awesome games to play during the month of November. These games are perfect for classroom parties, family fun, rainy days and more! 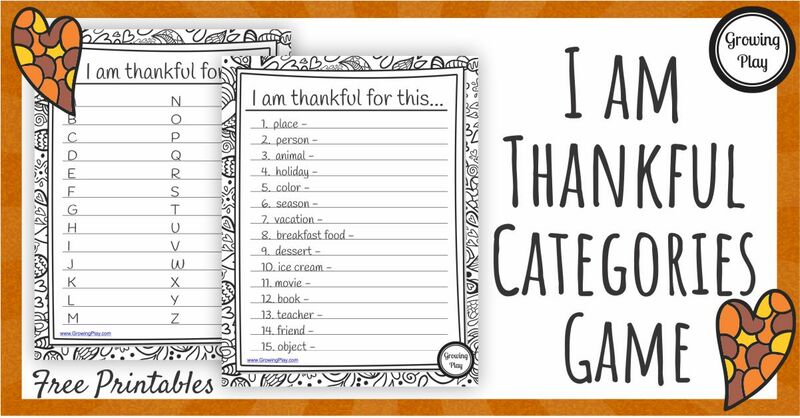 DOWNLOAD YOUR FREE I AM THANKFUL CATEGORIES GAME when you sign up to receive our email newsletter. If you are already a subscriber, enter your email and you will be redirected to the link.